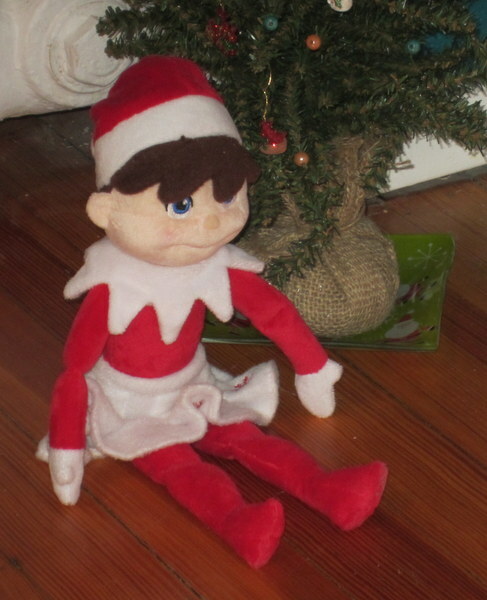 The fantastic thing about buying into the stupid, terrible Elf on a Shelf thing (or having your child buy into it for you) is that you can wake up and, first thing in the morning, realize that you have Failed As A Parent again. That was my morning. I woke up and headed downstairs and J was stomping around and immediately I knew: I hadn’t moved Holly the Elf. Oh, man, I hate it. The thing is, on a good day, J is chortling away at Holly’s new choice of location, her nutty antics or, once in a while, a lovely little treat. But these good days require me to remember to move her. I went to a Board of Education meeting last night that dragged on and on, then I worked on the KidsOutAndAbout newsletter, and next thing you know it was past midnight and I was past remembering the important things. Like Keeping the Magic Alive For My Young Daughter. It wasn’t a great start to the day. J was unpleasant to be around, and then, when it was 2 minutes before she was allowed to leave for school (because both of my kids go as early as they are permitted, not a trait that they inherited from their mother), we went outside to watch M and Cute W juggling soccer balls. Cute W was saying goodbye to J and I gave M a big fake good-morning smile and. . . she was also deeply unpleasant for no apparent reason. So then I walked into the house and cried, but only for about 2 minutes, and it could be lunar-calendar related. When they got back inside, M seemed to feel a little bit guilty about it, though, so that’s a plus, right? I went to a class at the Schenectady JCC that you should probably try if it’s local to you. It’s a Medicine Ball-Pilates class, which means that for the first half you’re doing cardio with a bit of weighted-ball strength thrown in, and then the second half is Pilates. Now that’s efficient! And I just found out today that you can walk in for only $5 for this class. Meanwhile, I’m super-sore from the HIIT Interval Blast class that I tried on Monday for the first time. It was taught by Jean, who’s locally notorious for kicking people’s butts. I thought, briefly, that I might throw up. But I worked out much harder than I ever do at home, so I guess I’ll go back. On an empty stomach. It’s also conveniently scheduled from 7-7:45 pm, and then M needs a ride home from her soccer practice there at 8 pm, so I’m working on recruiting other soccer parents to join me. What else? Oh, I tried to donate some pajamas and other clothes at Things Of My Very Own late this morning, and I walked right into somebody’s house! They’re located at 202 Front Street, so when I saw a wide-open door at 202A, I walked in to ask if I was at the right place. Ummm, nope. The women were laughing: apparently I’m not the first. Once an old lady was inside the apartment sitting on their couch when they got home! For the record, if anyone goes to make a donation, take a left into the parking lot, then look right to see the entrance, which had a small paper sign on the door. J just walked by and noticed the picture of Holly. I quickly scrolled away from my writing and held my breath. “You heard that Holly didn’t move last night, didn’t you?” I said that I had, and that I thought that maybe she just really thought that J’s room was cozy. Sure, I threw my elder daughter under the bus. But it’s a small price to pay to keep some magic. @Colleen ugh, yes. Except that while the overachieving thing makes me a little nutty, then I feel bad because making fun of a nice mommy trying to entertain her children is mean, too. I’ll take all my scorn and bitterness out of the purveyors of this stupid trend, who this year are selling clothing and accessories for the damn elves!